Home spelling practise is very important, as we are not just learning words for a test, but to improve our vocabulary and writing. 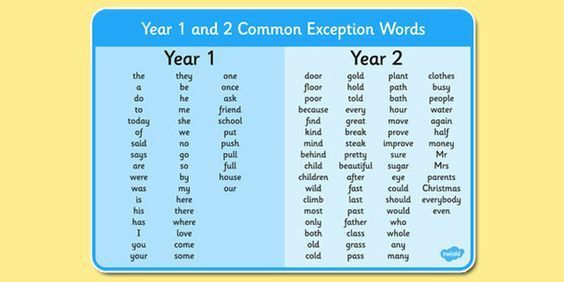 Please encourage your children to practise the year 1 and 2 words. A research-based topic homework will be sent home each half term. This will be an in-depth homework which will allow your child to delve further into our topic and consolidate their learning. Please help you child to practise and learn number bonds for all numbers to 20 (e.g. the pairs of numbers which make each number: 7 and 3 make 10, 5 and 4 make 9, 13 and 4 make 17 etc.) as well as their 2, 3, 5 and 10 times tables. These are now part of the National Curriculum for Year 2 children and will be essential to their progress in Maths this year. Our PE day in Spring term is Friday. Please ensure your child has their PE kit in school and safely kept in their lockers. We will send PE kits home with children at the end of each term. A PE kit should consist of; a white t-shirt, black shorts and pumps. Children need to remove earrings before the lesson, if they are unable to do this please do this at home. Reading at home has a big impact on your child's learning. Listening to your child read is great but make sure you are also questioning them, this will help improve their comprehension skills. We ask you to ensure your child brings their reading book to school every day. If your child has finished their book, we ask you to sign your child's reading diary and then it is your child's responsibility to put their book bag in the 'My book needs changing' box. If a child's book bag is placed in this box, the teaching assistant will change the book ready for the child to take home that night. At Linaker we use Read Write Inc to help children learn to read. It has been used for many years in schools and has supported children to enjoy reading and make good progress. RWi also helps children to talk about and understand what they have read. Reading helps children develop their vocabulary and learn new things independently. We want all children to enjoy reading. Children will be taught in mixed groups by trained staff. First children learn a simple code to help them read. Then they learn more complex sounds. Fred is a frog puppet who says, reads and spells words in pure sounds; he never says the whole word so the children do this for him. He never adds ‘uh’ after a consonant sound e.g. fuh, luh (a slight ‘uh’ cannot be helped when saying the sounds b, g, d, j, w and y). Here you can find a video on the correct pronunciation of sounds. Children are taught to ‘Fred’ talk words by sounding out and blending to read. m_a_t Children are taught to spell by hearing and saying sounds in a word before writing them down. We call this using ‘Fred’ fingers. A grapheme is one letter or group of letters used to write one sound, e.g. the sound ‘f’ can be written with the grapheme f (fun), ff (huff) and ph (phone). Syllables are chunks within long words. The root is the part of the word that gives the most meaning. Things to help at home. Some parents have been asking for things they can do at home to further help their children. Below are some links and documents that may come in handy. In read, write, inc we Fred talk (sound out) words. You can Fred talk green words, but you "can't Fred a red!" Below are some PowerPoint presentations, there are three different levels for green words, your child should know what level they are on. Set 1, 2 or 3 sounds. This is a video of a RWi parent tutorial.